Today's post isn't exactly fun, but it is important. Because the reality is that some of the things we use day to day can't simply be thrown away and forgotten about. Paints, cleaners, oils, batteries, electronics, light bulbs, cleaning products… What are you supposed to do with all these once you’ve used them up? You don’t want to pour potentially hazardous chemicals down the drain where they can pollute the environment and potentially harm wildlife or even human life. But you’re also not sure you should throw them in the trash. What’s the best way to get rid of these things? The U.S. Environmental Protection Agency (EPA) labels any household product that contains “corrosive, toxic, ignitable, or reactive ingredients” as “household hazardous waste (HHW).” It’s these products that we need to be careful with when we’re done with them. Even if we're using natural skin care and green cleaning products wherever we can, there are still some products in our lives that leave us scratching our heads when it comes time to dispose of them. To help you out, we’ve listed the most common HHW products below, with guidance on the best way to dispose of them. Before taking any other steps, check with your community trash. Some areas offer home pickup for HHW or “home-generated special materials.” Most likely you’ll put your special materials into a unique container, away from your regular trash, and leave it for the home pickup professionals. Some communities that don’t have year-round HHW collection programs may have designated times for collecting certain waste items. They may also have drop-off points where you can take your materials for recycling or proper disposal. Also, always check the product label. There will often be instructions about proper disposal. Recycle old oil through local oil distributors and auto-repair stations. Take antifreeze to a household hazardous waste collection program, or check with a local automotive repair shop for directions. Recycle batteries at stores that sell them. Pour brake fluid into a container of cat litter and leave in a safe, well-ventilated place. It will evaporate within a few days. Check with your community—some offer recycling services for alkaline batteries. California mandates recycling for almost all battery types. Never dispose of batteries in fire as they could explode. If you have a large amount of these batteries to get rid of, contact your trash disposal company for instructions. Many retailers will now take rechargeable batteries, including Best Buy, Home Depot, RadioShack, Target, and more. Most electronics manufacturers have programs in place to take the items back—either through drop-off locations or through the mail. Best Buy and Staples, for example, both have drop-off programs for everything from computers to fax machines. You can also get rid of cords, cables, computers, printers, and the like at these stores. Dell computers has a recycling program that allows you to drop off any brand of used equipment at participating Goodwill centers. Apple also provides free recycling of any brand of computer, iPod, or iPhone. Most cellular service providers will recycle old phones. These contain a small amount of mercury that can be potentially hazardous. Visit search.earth911.com to find a recycling location, or check with your local hardware supply store, as many of these offer in-store recycling. If you don’t find one, check with the manufacturer—many sell pre-labeled kits that allow you to mail used bulbs to recycling centers. See the EPA site for a list of mail-back services. First, try to use up the product or give it away to someone who will. If this isn’t possible, check with some of your local non-profit organizations—they may be happy to have some free cleaning products. If all else fails and you have to dispose of the products, check the product label for directions. Typically, you can dispose of the product in the same way you use it. Most liquid, gel, and powder water-soluble products can be disposed of down the drain with running water. 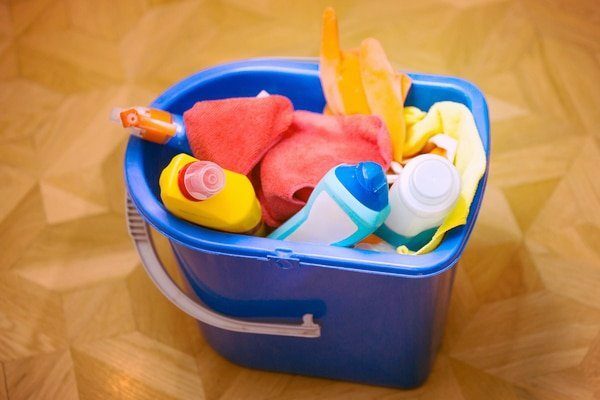 Most solid products like towelettes, scouring pads, and soaps can be placed in the trash. For more hazardous materials, like oven cleaners, tile cleaners, and crystal drain openers, call the manufacturer for recommendations, or check with your local waste disposal facility. First, make sure that you need to throw it away. Properly sealed, paints and stains can last from 10-15 years. (To seal, leave in the original container, cover the opening with plastic wrap, put the lid on securely, and hammer it down. Store in a cool, dry place.) If you have to get rid of it, try to donate it to a friend, local school, or other organization, such as Habitat for Humanity. If you can’t use them up, consider giving them away. Do not pour down the drain or into a storm drain—it’s against the law. Take them to your community HHW site. (It’s best to wrap them in plastic before transporting them.) The store from which you bought the product may also accept it back for recycling and disposal. Again, try to give them away to neighbors or local pools that may need them. Otherwise, check with your local stores that sell the supplies—they may take them back. Your local hazardous waste facility will also take any that you can’t donate, or check with your city or county’s waste management department for hazardous materials pick-up days. Those who need to use needles and lancets at home (such as diabetics) may wonder what to do with these sharp items. They can pose a risk to waste workers. Take them to appropriate collection sites, such as doctors’ offices, hospitals, pharmacies, health departments, or fire stations. You can also look for “sharps mail back” services that will take used needles back by mail. Some manufacturers also sell at-home needle destruction devices that break or burn the needles to make them safe for regular disposal. The FDA recommends that consumers and caregivers get rid of unused medications as quickly as possible to reduce the risk that someone may take them unintentionally or misuse them on purpose. Don’t flush them down the toilet, though, as they can contaminate groundwater. Many communities have “take-back” programs—check with your local law enforcement agency. The U.S. Drug Enforcement Agency (DEA) also has authorized collectors who will properly dispose of pharmaceuticals. (Check here for an authorized collector in your area.) If these options aren’t available to you, mix the medications with dirt, kitty litter, or used coffee grounds, place in a container like a sealed plastic bag, and throw it out with the trash. What steps do you take to reduce your use of hazardous materials? Excellent Tips!! Thanks for sharing information about Household Waste Products Properly. It’s beneficial tips.